What’s all of the fuss about eBooks anyways? The library world is abuzz with talk of them. Are they the death of the printed book? Will they put public libraries out of business? Do they violate the rights of authors and publishers? On the plus side, an eReader can store hundreds of books, are thinner than a magazine, are lightweight, and can be loaded 24/7. The font size can be adjusted easily. Some models also can access the Internet, so they are multipurpose devices. Perhaps, most notably, they save a few trees. From a library perspective, there are no overdue materials to chase as library-loaned content simply expires on the due date. Plus, eBooks are digital and don’t cause shelving or space issues. Digital eBooks aren’t without their drawbacks, though. Most often, purchased titles aren’t infinitely sharable like a printed book. Some publishers will let you loan out your book once or twice for a set amount of time, but you can’t pass around the great new book you’ve bought to all of your friends. Although they’ve come down in price recently, eReaders can still cost $100 to $300, so it’s a technology not everyone can afford. Library staff requires some training to help customers get connected to download their first few titles. Plus, for some, settling in with an eReader just doesn’t have the cozy feeling like cuddling up with a printed book. 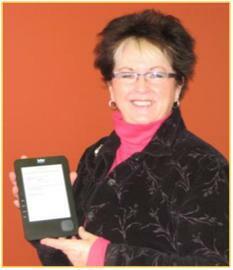 The Guelph Public Library has declared 2011 as “The Year of the eBook” and has established a task force to “position GPL as the local expert in accessing, using and promoting electronic books.” We subscribe to OverDrive, an online service that provides eBooks for loan to members. GPL spends $1,500 per month on approximately 30 titles and has over 400 regular customers who download 1,200 titles each month. GPL staff answers about 15 eBook questions per day at our six locations. What have we learned so far? The eBook will not replace the printed book. Like paperbacks, CDs, or Playaways, eBooks have their own merits and will find a niche in the public library’s arsenal of resources. It will be popular with the early adapter, the popular fiction reader, and the traveller. (We had one customer download an eBook from GPL while on a business trip in China!) They will not be popular with the beach crowd or nonfiction readers (at least until they are spill-proof and illustrations are clearer). For more details, visit http://www.library.guelph.on.ca/blog/index.cfm . For those who wonder if I have taken the eBook plunge, I am waiting for RIM’s new Blackberry Playbook to be launched this spring. I hope to spend my summer vacation in the backyard reading Janet Evanovich! Subscribe to comments with RSS	or TrackBack to 'This eBook Thing? #8:2011'. I’m a technology professional deeply interested in consumer technologies. I’ve had a kindle, and I’m an avid iPad user (so is my entire family!). Please let me know if there is anything I can do to help with your “Year of the eBook”! I am trying to get used to the the ebook thing but I find reading a very different process when it is on a screen. I feel I am much more distracted. I wonder if it is the type of book that would make a difference? As I love children’s literature maybe a picture book would be much more enjoyable.